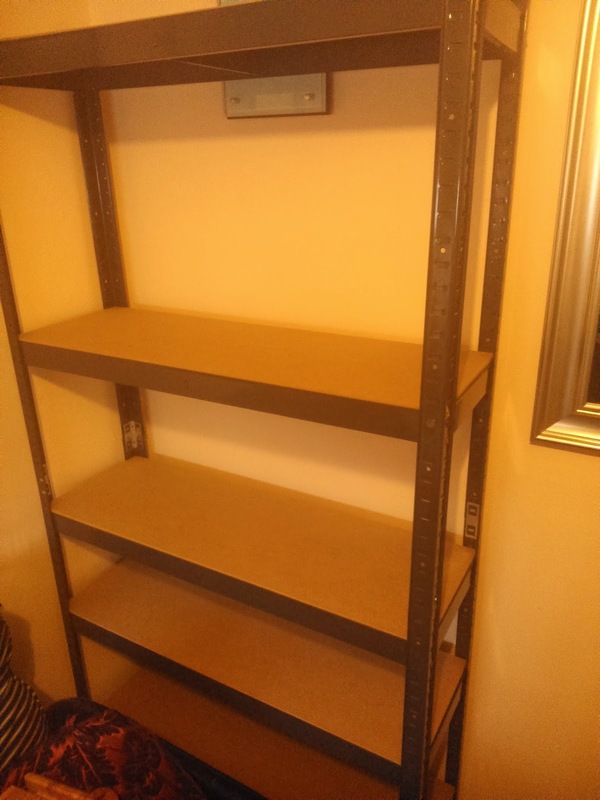 Now that DIY is something I'm beginning to get more confidence in, I've been having a good look at my home to see what needs updating/replacing and the first thing I came across was my old, broken shelving unit. It's in my spare room, office, junk room and holds a lot of my work books, some of which must have taken about 100 trees to create. Over the years the unit has started to bow with the weight of these beasts, and the back is now pulling away from it; All in all it's not a nice sight. So a new one was needed. Randomly I was contacted by a garage shelving company called Tufferman to see if I could test one of their 3 Storalex Bay storage units, which is when I had a lightbulb moment and asked if I could try a smaller version as a bookshelf. The bays usually come in sets of three which would be far too big for my small flat, but one bay would be just right. 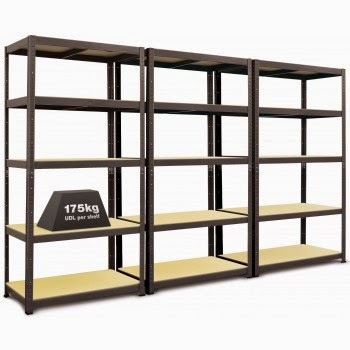 They liked my idea, and I was happy because their storage units are designed to cope with 175kg per shelf, so I could pile my books and any other junk on there with no fear! The bay came flat-packed, but thankfully there were easy instructions and everything was lightweight. 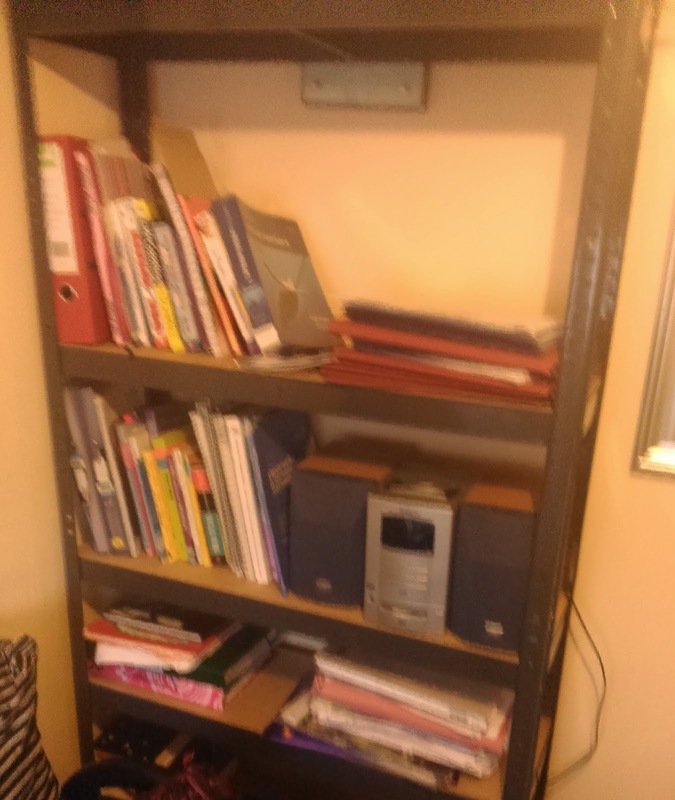 All the pieces literally click into place, and you can position each shelf how you want, so I was able to do different heights for my folders, books and even shoes! It only took me half an hour with Chunk handing me little pieces every now and then and asking if I could "do it gently" when it came to banging some of the pieces into place. I loved how easy and quick it was to assemble, how easy it was to then move into the room I wanted it (all by myself) and how much it has been able to store. I'm glad I thought outside of the box rather than assuming because I don't have a garage these would be of no use, because they are perfect for my heavy needs! If you need any shelving in your home or garage and like the look of these, why not enter my competition to win 3 Bays of Storalex Units below. Good luck! For the purpose of this review I was given one Storalex Bay. No payment was received and all opinions are honest and my own. I have lots of things in need of a space to put them,books,dvds,games. All my study materials, have actually just been pricing up something similar. In my craft room with all craft books and bits. In my garage with all my gardening, tools, paint, and children's garden games on! My partners tools he is a mechnanic they are everywhere. These would fit perfectly in my garage! I would put my storage boxes on the which are filled with craft items and other bits & pieces. In the garage, I am desperate for it to be organised. We have lots of tools still in boxes all these years after the move, and hobby stuff. Would be great to be able to see what there is easily. They would be ideal for the shed. I've got so many books these would be great oh and one to put loads of lego on! Unless i have to fight OH for his tool boxes going on them! They would be ideal for storing my collection of ceramics. I would store all my books and the childrens books on it. Helps to keep everything organised and at the moment they are scattered everywhere. Fleur JJ Webb My little girl is ladybird mad and at only five she has a massive collection of lady bird stuff . She wants shelves for Christmas to display her beloved collection on, so this would go to her so she can carry on with what makes her happy. My shed is a mess and we can hardly get in there, so these would be really useful! Books - our collection is always growing! I'd tidy out the under stairs cupboards with one of these and use the other 2 in the shed. In our shed - all our junk is on the floor & these would be great! I would store my life on these shelves!! this would be ideal for storing my LP record collection! I would use it for my books as my last one broke as they were too heavy.It's actually books holding up the broken shelf too lol.I would also use it for my games and cd collection. It would go in the shed for the gardening tools etc. I would store boxes of baby clothes and CDs. I would tidy up the garage and have organised shelves for car bits, gardening things and then all the plastic outdoor stuff for the kids to play with!! I'd finally be able to sort our shed out! They would be very useful! Gardening tools, DIY tools and craft items - perfect! I'd put them in our outhouse to store all the boring stuff like paint and tools! I've got hundreds of books so I would fill the shelves with them. Would sort my garage out, put all the tools, gardening stuff etc on them. Has to be the garage. It's a mess! Books - put them in living-room as an industrial look. I'd finally get around to sorting sand storing all my craft stuff! What would you put on these shelves? All my homegrown pumpkins, butternut squash and marrows! My son's soft toys - he has enough to fill all these. I would get some plastic boxes and put all our toys on them. A good place for outdoor shoes as well. I would use it as toy shelving and for their books. I'd also see if there was space for our boxes of craft items too. I would put it in my garage so it can actually be organised with all my babys bits that he has grown out of. I would give it to my son to put tools on in his shed. All our books, cds and general clutter! I would put all my cat ornaments on them. I love my cats and I would love these shelves! my other half Carl would probably pinch them to use in the garage so tools and paint I guess! My OH is about to build a new garage, and needs shelves for his tools. I have lots of books and folders because I'm a teacher. This would be very handy to store all my work stuff! Im having my loft insulated soon so i would use these up there to help keep all my bits tidy and together in the loft. my garage which is an absolute tip at the moment as crying out for storage shelves! They would be perfect for our home office, which is a bit of a shambles at the moment! Books - I have 100s that haven't seen the light of day since I moved house (3 years ago tomorrow!). I would finally be able to arrange my garage so it doesn't look like a tip! I would use them in the garage as its a tip just now - it would be tools and paint tubs etc going on them! Fill them with books and notepads. would be ideal to store toiletries,cleaning products toilet rolls and tins,I tend to do a lot of bulk buying,but my cupboards get very crammed! With some juggling around, I'd put them upstairs in the large room. We've just one corner that needs a good tidy and shelving would be perfect for books, my tool bag and maybe even a small citrus plant. I'd put one set in my kitchen recess for storing bags and the big dog food sacks... one would go out to the shed to make space on the floor and improve access; and the last one would go into the outdoor room at the front of the house for storing all the clutter from indoors, under the stairs!! My OH is a writer and researcher and has SO many books, folders, research files - these would be a godsend! The heaps of crap that is currently on the garage floor! Books & some family pictures. This would sort all my partners work things out, so I can reclaim my garage! I've got piles of book with no home! I would put books, ornaments and photographs on those shelves. In the garage - my husband keeps complaining he can't find things - I want it all organized and labelled. it looks like I could put everything and anything on it, especially all my husbands fix it bits. toys, toys, toys... my house is overflowing with them! oh and kids shoes and books. my girls are spoilt! Could do with these in my life ! I'd put my children's toys on these. I would use them for my husbands hordes in the garage! All the tools that are currently on the floor! They would be ideal to put my dvd collection on. I would stockpile all the bargains I get through couponing and shopping savvy as you can never have too much toilet roll! I'd use the shelves to help sort the garage out. So they will be filled with my potting stuff & gardening tools. All the tools that my husband insists on leaving on the floor!